I've done it! I've reached a major milestone on the Persian Peony Tile project! I haave finished couching all the stems of Japanese gold T70 thread with green silk floss, and finished embroidering all of the leaves. I've also added the last two beaded prunus flowers under the large red flower. When I realized earlier today that I was almost finished with the leaves I had a very difficult time tearing myself away from the project. I had to force myself to get up and stretch, after all, I can get very creaky if I sit too long without moving. It seems that when I see an end to a project looming ahead, I tend to work on it without stopping. I am very anxious to get to the next stage and do something different. I have to admit that I was getting a bit tired of the leaves, even though I just love that green color. By the way, it's Au Ver a Soie, Soie d'Alger, No. 1826. So, what to do next? The instructions tell me to finish the large peony, so that's what I'll probably do. Then it's on the the peony buds, then the purple knapweed flowers. The instructions have a really interesting way to mark the placement of the purple threads, and no, they are not random. They are very precisely placed. I'll show you the technique in a future post. It's pretty interesting and works very well. A side note: Most instructions I've seen for plunging metal threads to the back of the fabric call for making a lasso of thread to grab the metal thread and pull to the back. However, Jane Nicholas - remember, she was the one who taught the Persian Peony Tile, has us using large darners for plunging. You can see in this photo just how large these are. I've found it works pretty darn well! (sorry for that pun) The needle makes a huge hole in the fabric, but it closes up immediately and you can't tell that such a large needle was used to make that hole. The needles, being large and stiff (well, they are metal) are easy to grab on the back of the work and pull through. I think I like this technique. It also seems to be gentler on the metal threads, not stripping the metal off the thread core so readily. So, what do all of you think? Do you like the lasso method or the large darner method? I'm really interested in hearing your views, as I'm sure I'm missing something important! If you would like to see the complete project, step by step, just click here to follow all of the posts. The front of the Smocked Heart, with a gathered ribbon rose sewn in place. I found in my stash some hand dyed 7 mm silk ribbon by Bucilla, "Baby Pinks" No. 7113. I have no idea where I bought it, but the pink matched the silk fabric beautifully. If you look closely, you can see the gathering threads that I stitched with sewing thread along one edge of the ribbon, knotting one end and leaving the other dangling. I took the ribbon with the knotted edge to the back of some scrap fabric in a hoop. Then pulled on the thread to gather the ribbon, forming it into a circle and stitching the long end down to secure it. Here's the gathered ribbon rose, still on the fabric in the hoop. I then cut out the fabric about an inch around the rose, gathered it over a button, and sewed it to the heart as shown in the first photo. I even added some gold beads for the stamens. Now for a bit more embroidery. I made three rolled ribbon rosebuds and stitched them so they peeked out from the center rose. Then with some 4 mm white silk ribbon, I stitched a few buds around the outside of the center rose. Oh, there's a pink bud at the bottom. It matches the silk so exactly it's hard to see. I'm not that practiced in silk ribbon embroidery, so I made quite a few of these on a piece of scrap silk before I was comfortable enough to work them on the heart. Even so, I had to pick a few of them out. This is a bullion knot-detached chain combination, which I used from the A-Z of Ribbon Embroidery by Country Bumpkin Publications. The directions in the magazine said to make a double colonial knot, but I couldn't figure it out for the life of me, so off I went to the A-Z book. That series is a gold mine! I noticed that I crushed the center rose quite a bit while working the little buds, but found that in the end, a light spritzing of water revives the ribbons beautifully. Here it is, all finished! I added a 5 inch beaded loop to the top. Now what I should have done is added some dried lavender to the pillow, but of course I thought of that at the end when it was too late. So this is just a pretty little decoration that I'll hang on a china cabinet somewhere. This technique of placing a lattice smocked piece around a pillow is interesting. I can certainly see it made up much larger in a darker color as a circular end pillow. No more hearts for a while. Promise. I was trying very hard to clean in the sewing room (honest!) last week and I came across Issue No. 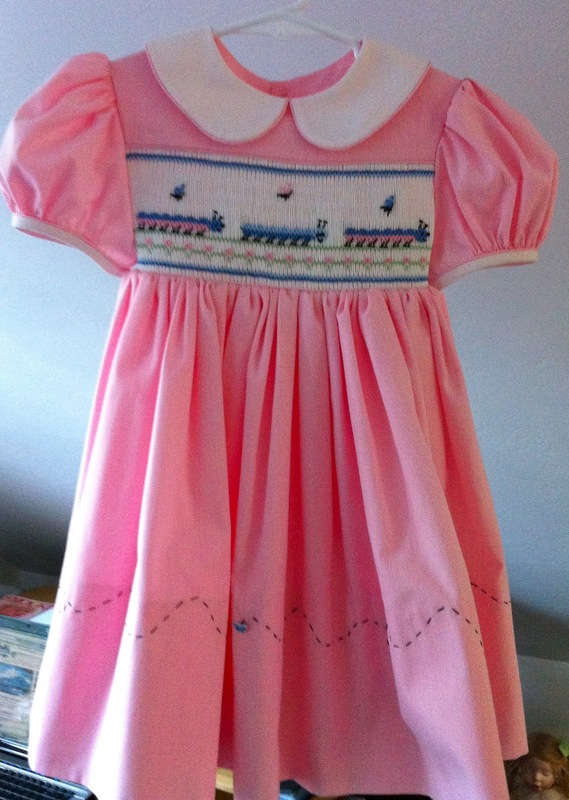 95 of Australian Smocking and Embroidery, (AS&E) that had this sweet little smocked heart. Since when I started it Valentine's Day was almost upon us, I decided to drop everything and make it. I got so involved in it I wasn't too good about taking pictures, but I think I can get the gist of it across. Here's the pattern with the grid for the lattice smocking. It didn't fit on one page, and the two weren't perfectly aligned. So I made sure of the grid spacing and alignment, then fudged the cutting lines. They are only 1 - 2 mm off, so not much of a problem there. This is such a little project I was able to scrounge around for all the materials in my sewing room. I'm using pink silk dupioni scraps from my sister's sewing business. I made all the markings with a blue washout pen, as a quick spritz of water erases all the blue. The instructions said to sew the side seams together; those are the two straight ends on the pattern above. Then smock the pattern on the wrong side using machine sewing thread, which was a bit cumbersome as the fabric was now in a tube shape. This is Lattice Smocking, a variation of North American or Canadian Smocking. I showed you an example of Lozenge Smocking, another variant, when I described a photo album cover I made at a SAGA Convention. I smocked two rows of the lattice. After completing the smocking, I had to fit it around a little heart shaped pillow made out of muslin and stuffed with polyfil. I pulled the ends tight on both sides, pushed the ends into the pillow as best I could, then stitched them to secure. The two rows of lattice sit nicely on either side of the pillow edges. On the back the fabric ends are hidden behind a pretty pink mother of pearl button. This was one of the buttons I received in that lovely raffle basket from the SAGA Convention. I glammed it up a bit by using gold beads. Actually, they were on the table as they were left over from the last pincushion. I think they make a nice contrast, much better than using pink or white, don't you think? Next up, some silk ribbon embroidery for the front! I've been having the most difficult time finding concentrated liquid starch to make into a spray for ironing. I finally ordered some from Amazon, but they took their time about filling the order (three weeks and counting) so I bought some non-aerosol spray starch from the grocery store. When that ran out I dug up this recipe, printed it on a label, and made it up in the leftover spray starch bottle (with original label removed). You're probably wondering why I just don't buy the aerosol spray starch. It's because I really hate the stuff. It doesn't work all that well and I find the fragrance awful. I read somewhere that the starch molecules need to be shortened to be successfully sprayed through the aerosol nozzle, rendering the product less effective, but I don't know how true that is. I searched all of the stores for the concentrated liquid that Amazon wasn't delivering, and finally found some at Walmart. However, in the meantime I've been using the homemade recipe and finding that I really like the feel of it after ironing. And the oddest part is, my son, who irons a shirt every morning, sees the recipe on the bottle and makes it up when it runs out. He doesn't put in the lavender essential oil or put it in the refrigerator, but just making it up is a big step! Sometimes I remember to put it in the fridge at night, but most of the time I forget. Luckily, it doesn't seem to spoil, so I think this is a good solution for us. I'll use up the two bottles of concentrate I bought from Walmart, then stick with the powdered cornstarch for the future. I've cancelled the Amazon order. Warning! I use starch quite a bit when sewing and ironing heirloom garments. But when I wash the garments prior to storing, I never add starch. After all, starch is a food (don't my hips know that!) and all sorts of insects and other vermin will find it very attractive. Adding lavender is a help, but to stay on the safe side, I store all heirloom garments without ironing with starch. It's best not to tempt fate. Today was a quiet day devoted to stitching. After finishing up a sewing project, which I will write about soon, I managed to get a few hours in on my Persian Peony Tile. It doesn't look like much progress, does it? But I did embroider all the lower leaves, outline and fill the two tiny ones under the big red peony, and couch a couple of stems. It was so nice to get back to working on this project. I really have missed it. So you may ask, why was my day so quiet? Two of the guys I live with (hubby and son) went out to the desert and practiced their shooting. You can see the mementos they left me on my sewing machine. Sweet, isn't it? It's Sunday evening and I had better start ironing some clothes for the week. Have a great week, and I hope all of you can get some stitching done! 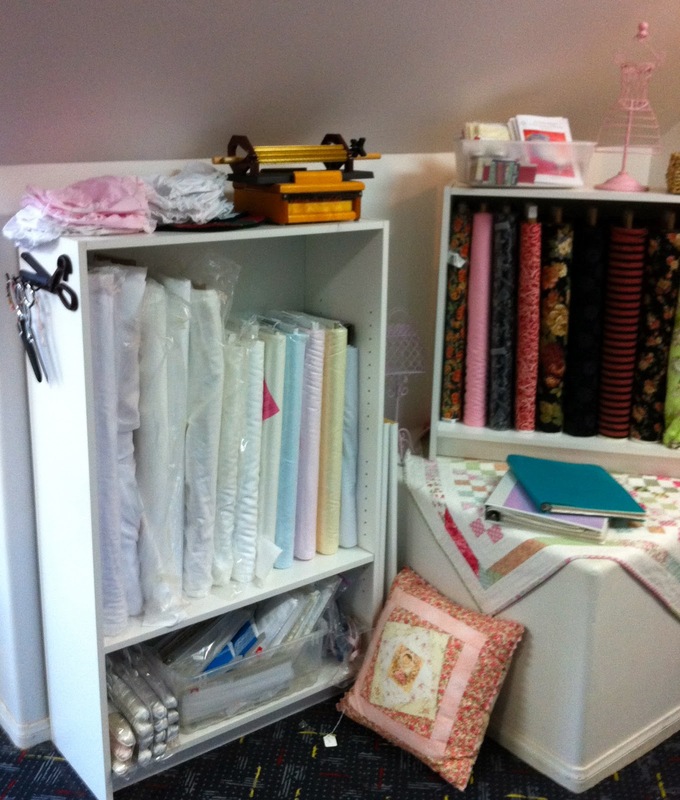 I went for a little sewing related shopping today, which means I've visited three new (for me) shops in two days! First of all, I picked up this bag kit at a shop right in my own town, called Sewing Party. I've heard about it for the past year and a half and finally managed to go there today. It's the only remaining quilt shop in South Orange County, and I figured I had better show up and buy something to help the business along. I picked up a bag kit, one of their own designs. The kit contains very bright and cheery fabrics, and even includes the batting and the bag handles. I'll make this up as a gift for my daughter. There were several people in the shop needing help with their projects and the staff spent a considerable amount of time with them, making sure that everyone was happy. 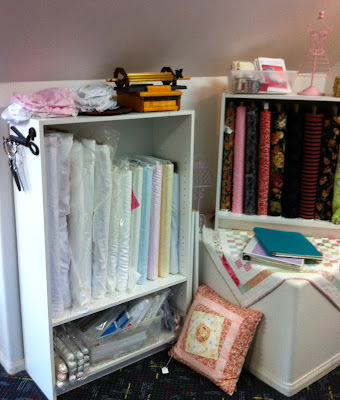 Then I drove up north (well, north Orange County) to Fabric Land. This store has been around for several years but I've never been there. I went today, lured by their President's Day Sale (ahh, don't we all love sales?). These fabrics are for a dress for my granddaughter. And so are these. Now I have enough fabric for about five dresses/tops so I had better get busy. The really fun part is that when I was in the second store I visited, two customers came in that I knew. That always makes a shopping trip more fun. Also, I was extremely impressed with the way the sales staff interacted with each other and their customers. They are very interested in what everyone is sewing, they give all sorts of advice if you need it, and point out that if you have trouble, to come in to the store for help. They want to make sure every customer is happy and does not lack for help on their projects. That attitude makes for great customer service in both stores! I'm just sorry I took so long to check these places out and I plan on visiting them much more often! Online fabric stores are great, but you just can't replace that personal touch from knowledgeable staff. So if you have a great local quilt shop or fabric store, please visit them and spend a bit of cash if you can. So I've told you about the shopping part of the day and I'm sure you're asking about the sewing part. Well, it's all utility sewing. I'm making a new ironing board pad and cover for my sleeve board and trying to take enough photos to describe what I'm doing, and translating it into the directions for the full size ironing board cover. I hope to finish tomorrow and spend a few hours on my sadly neglected Persian Peony Tile. I've mentioned before that I used to shop at a lovely heirloom sewing and quilt shop in Vista, California, named Sew Special. It went out of business about three years ago when the owner decided to retire, but luckily, one of the employees has now opened her own shop. 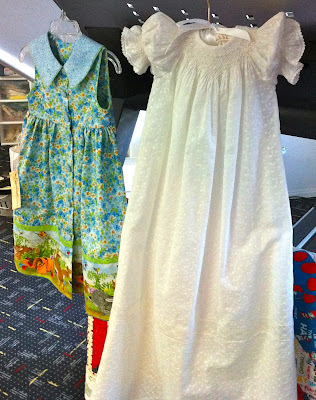 Lynn Postulka has opened her new shop, January Girls, at 1764 Montgomery Drive, Vista, CA 92084, 760-758-4692. I learned to smock from Lynn about eight years ago. See that pink and white quilt in the right front? I made one very similar to it for my granddaughter. I think I've read somewhere how to smock this quilt with the lace up the front but I have no idea how. I might be able to figure it out, but my head hurts thinking about it. A lovely christening gown next to a darling springtime dress. Lynn is great at picture smocking. Look at those caterpillars! 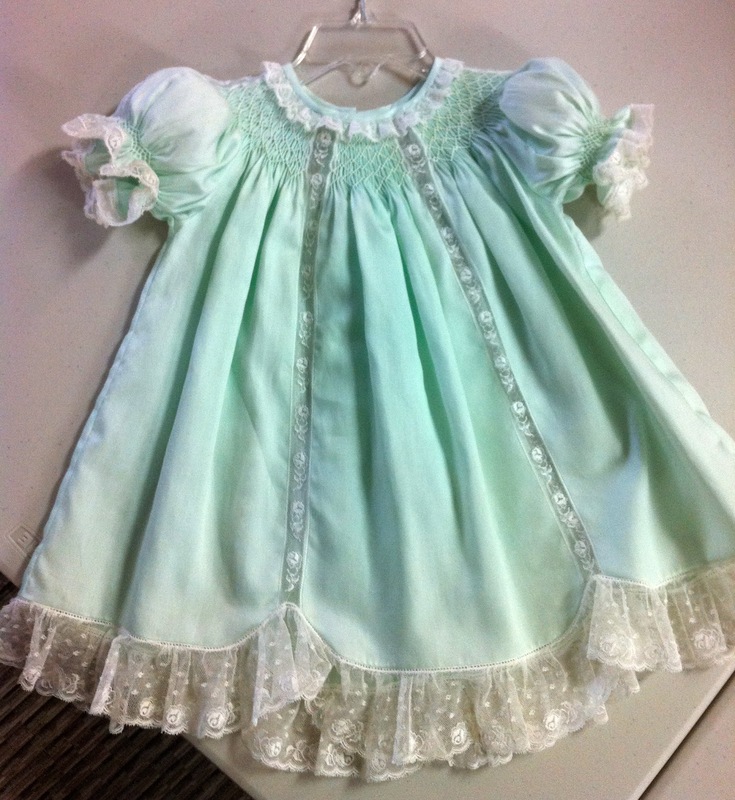 I love this nightgown, so nice and cool for summer. 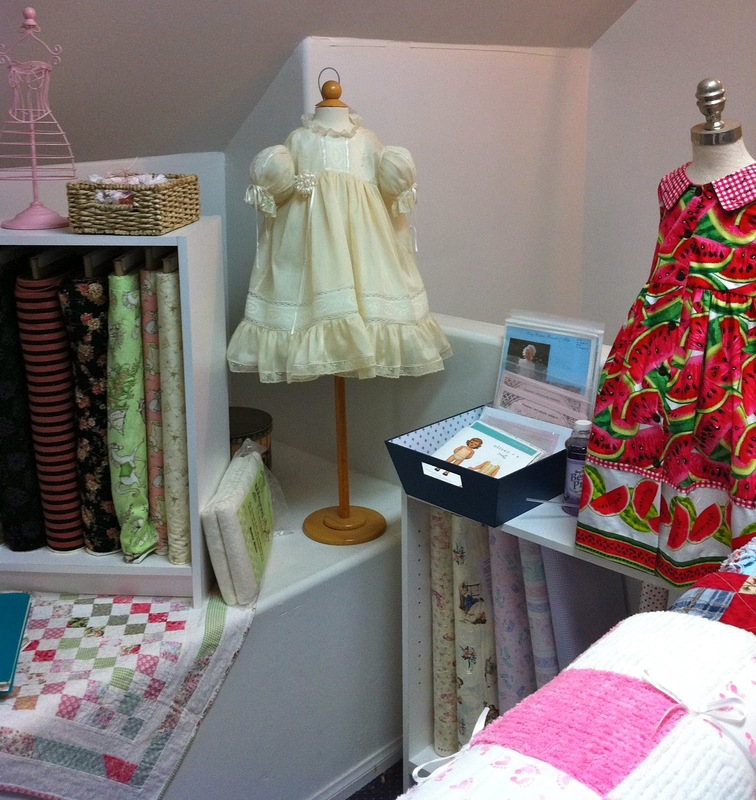 Another corner of the shop. Lynn is getting new heirloom fabrics and laces every day, and will soon have her website, JanuaryGirls.net, up and running. Remember the dot net address, that's very important. The dot com address is not for families. Can you see the tiny bit of green fabric on the right? You can also see it in the first photo. I bought some, along with this Primrose Lane pattern. I'll make a dress for my granddaughter once I find some nice coordinating fabrics and trim. Notice the pattern is sized from 2 - 12. What a bargain! I hope those of you in Southern California can make it to Lynn's shop! 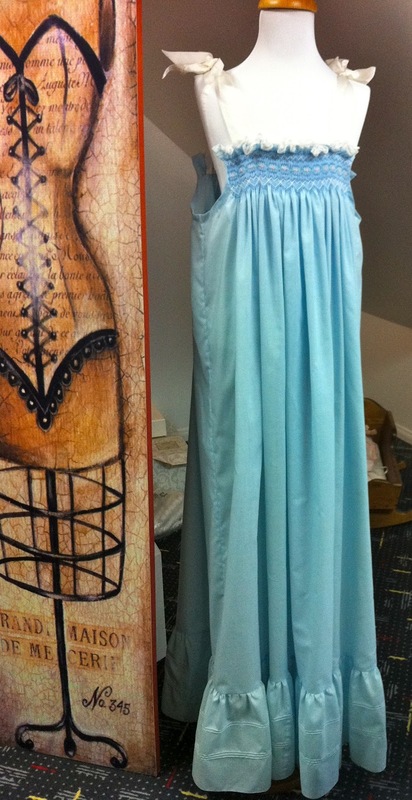 It is so fun to see a shop with these luscious fabrics and laces once again. But this one is a bit different from the others I've made. It actually has emery in it, to keep the needles nice and sharp. I found the kit as I was attempting to clean up the sewing room this past weekend. I think I bought it at the Long Beach Quilt Show last July, and it's been hiding under stuff for the last seven months. It's from Bird Brain Designs, which has all sorts of darling kits. One of the things I really love about quilt shows is the vendor stalls. I just love wandering around them and picking up little kits that I can put together easily. This is certainly one of them. It has all of five components, if you count the two colors of perlé cotton. Well, six components, as I added the beads. This was so quick and easy I kept forgetting to take pictures, but as it's so simple the photos are really not necessary to explain the construction. I traced the two pieces out on freezer paper, ironed the pieces to the wool, cut them out and started stitching. I did add most of the beads before sewing the strawberry body, but afterwards added a few along the seam line. After gathering the top of the strawberry slightly I placed it in a shot glass to pour in the emery. Then finished the gathering, secured the stitches and added the leaf top. This was secured with little stitches in the inner portions of the design. It was so quick and easy it only took a couple of hours to make, and I even have quite a bit of emery left over, although I don't think it's enough for another pincushion. However, Bird Brain Designs sells emery on its website, so I can always get more. Two posts in two days! Don't get used to it, it probably won't happen again for a very long time. I'm trying moderately hard to clean the sewing room of unfinished projects and assorted clutter. So I didn't rest today until I finished this smocked hanger cover, my second one of this pattern from AS&E No. 41. I had originally planned to work some feather stitching in the fabric sections on both sides, but I decided not to. I didn't like the way the colors played out on the smocking. If you remember my last post on this subject, I was using Needle Necessities overdyed floss. I did use two different flosses, but you can't even tell that they are different from the finished piece. So I didn't bother with the embroidery on the flounce, as I didn't like the colors in the finished piece. Here it is, all finished and ready to go into my closet. I plan on making several more of these to use for my heirloom cotton nightgowns (which are great for us ladies of a certain age). But I think I'll try to match them to the various nightgowns I have, which are pretty much all white, with a bit of blue or ecru here and there. I was finished! I now have four of these, three from kits and this leftover one. I decided at the last to whip the main stem and the secondary stem for the pink flower, as I think it gives it a bit more depth and texture. These threads are Heathway wools and Gumnuts Poppies, a wool/silk blend that is sometimes slightly variegated. You can see it in the far left leaf in the light spot close to the pink flower. It was sating stitched with on piece of thread which happened to have a light spot in it. Now it's off to find frames. So this wasn't much stitching this weekend, was it? I did spend Friday sewing a new ironing board cover and pad, but I didn't take very many photos as I was so caught up in thinking how to make it and working on it. But here I am ironing an old napkin I inherited from my grandmother on the new cover. I plan on making new pads and covers for my sleeve board, so will explain what I did when I make them up and will take more photos. It's mildly innovative, if I do say so myself. This weekend we worked on the yard, cleaning up debris, weeding and planting early vegetables. It's been in the low 70s so it's just marvelous to be outside. But I do need a nice long soak in the tub to ease my aching muscles!